Get trained and certified in stormwater management! Apply to join our free career training program. Information sessions are held every Tuesday at 1pm (arrive by 12:30pm) at the Center for Sustainable Careers. For more information, call (410) 929-6120. As a Stormwater Management Training participant, you will learn to safely install effective best practices that reduce and clean polluted stormwater runoff, improving the health of our Chesapeake Bay so that all Baltimore residents will be able to enjoy our waterways. You will work with companies in the region that perform stormwater installations, landscaping, and stream restoration. This technician training is the first of its kind in the Mid-Atlantic region. 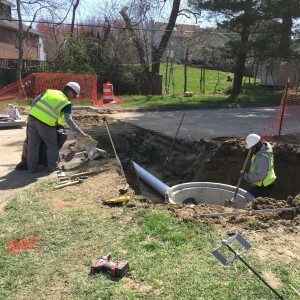 Homeowners, businesses, and government offices across the country are seeing the benefits of installing stormwater solutions. Stormwater management is an industry primed for expansion and job creation. As a participant, you will start your training in a classroom and hands-on learning setting, earning industry recognized credentials, including the Clean Water Certificate. After successfully completing the classroom and hands-on components of the training program, you will have an opportunity to participate in paid on-the-job training. Individuals who have met all eligibility requirements above will go through an interview and screening process. Program graduation and employment assistance are based on successfully meeting all program requirements, including but not limited to, demonstration of relevant construction skills, passing course exams, punctuality, and attendance. Our graduates are placed into entry-level green careers with employers that offer a living wage ($13.00-$17.00 per hour) and opportunities for advancement. For more information about the application process, please call (410) 929-6120.